SafeAssign is a plagiarism prevention tool offered by Blackboard. This service helps educators detect unoriginal content in student papers. In addition to acting as a plagiarism deterrent, it also has features designed to aid you with learning about plagiarism and the importance of proper attribution of content from other sources and by other people. You will find that submitting SafeAssignments and attaching files within them is very similar to regular assignments. However, SafeAssignments are created using a completely separate tool and identified by a different icon than regular assignments. You can identify SafeAssignments by the icon located to the left of their titles in the content area. Once you enter the SafeAssignment, you will see the assignment information again. There is a comment box in which you can make comments and a Browse button with which to attach a file. The following are the current acceptable file formats for SafeAssignments: .doc, .docx, .txt, .rtf, .html, .pdf, .odtv. Once you have completed the Assignment offline, save it in one of the acceptable formats. Next, use Browse to find and attach your file. Click Submit. Once submitted, SafeAssign checks the originality of your work by comparing the text to text on the Internet, within published articles, and to the work of other students at UALR. The amount of time it takes for SafeAssign to review your work depends upon the demand on the system and the length of your submission. Allow approximately 15 minutes for the report to be complete. To access the original report, return to the SafeAssignment, then click “View/Complete“, then click OK to access your results. Proceed to the next page to learn how to interpret the results. Within the SafeAssignment, you can access the text of your submission, the actual file, the percentage that your work matched that of others, and the SafeAssign Report (if allowed by your instructor). 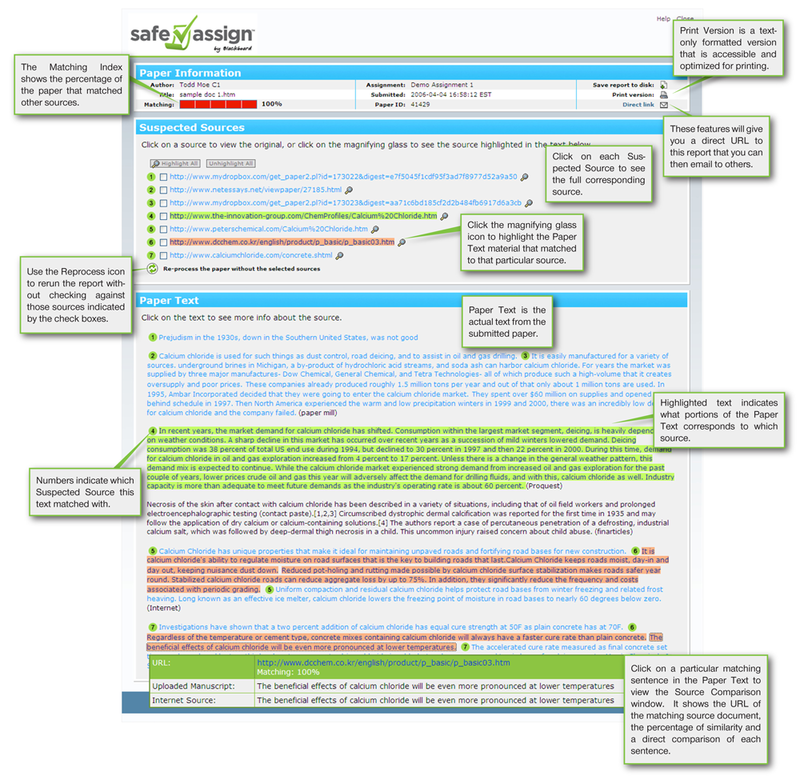 The full SafeAssign report (displayed on the next screen) shows the phrases in the paper that match existing works and the original sources. Keep in mind that just because your text matches another source, you are not necessarily guilty of plagiarism. When using references from published materials, you can help deter accusations of plagiarism by accurately and adequately citing your sources and by making an effort to show how the material is used it to support your work. File Click to open your file in an application on your desktop. Matching The number displayed here is the percentage of text that matches other submissions or sources. Report Click the icon to view the SafeAssignment report. If your instructor has graded your submission, you can see your grade and any comments left for you. 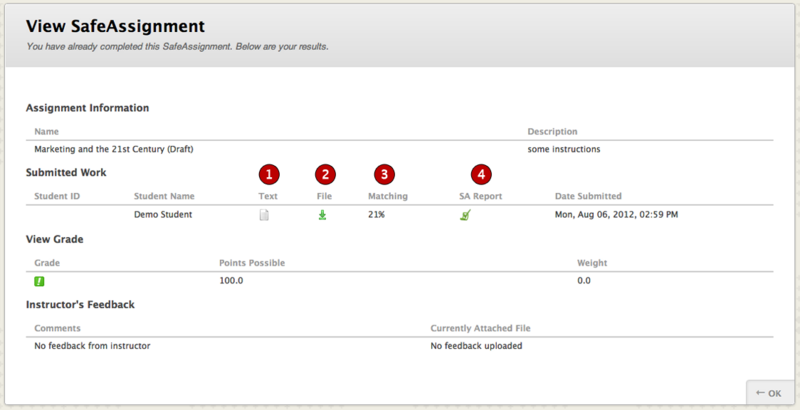 If your instructor allows you access to a SafeAssign report, the results will look similar to the picture here. 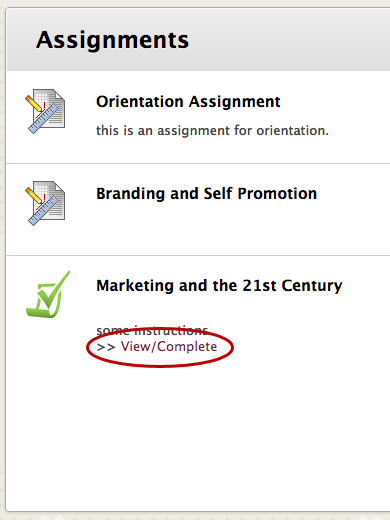 This report is also what a instructor will see for each SafeAssignment you submit. Take a few moments to familiarize yourself with the report results.